What is one thing about motherhood that you never expected? Let's be honest, that can be an awful lot! Motherhood in and of itself is full of the unexpected! Before becoming a mother, you have all of these expectations of how you are going to be that perfect mom--- the one that never leaves the house in sweats or yoga pants, that bakes the perfect birthday cakes, that has Pinterest worthy parties and holidays, that never loses her patience with her children, ever. And then you actually become a mother... try as you might, some of those things fly right out the window. Motherhood is much harder than expected! Don't get me wrong, it's absolutely the greatest experience in the world too, but still it can be exhausting! Sick kids, extracurricular activities, sleep troubles, sibling arguments... the list goes on. I think as mothers, we need to be able to find that time to unwind... even if- like me- that unwinding time has to be done with the kids. For many, adult coloring books can provide just that. 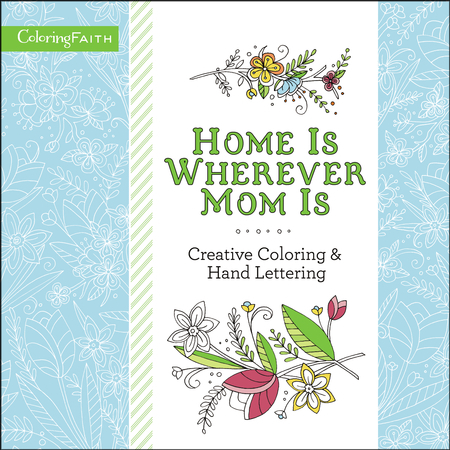 And today, I'm excited to share the perfect coloring book for every mom- Home is Wherever Mom Is: Creative Coloring and Hand Lettering. Treat your mom to something special this Mother’s Day with a new Creative Coloring & Hand Lettering book. Combining two major trends of coloring and DIY and by adding hand-lettering guides and stencils to the beautiful pen-and-ink artwork, this book will generate hours of peace, reflection, and enjoyment. Now, I must admit, I have quite the large collection of adult coloring books these days and I love them all. But this may be my new favorite. First and foremost, the pictures are gorgeous. So many stunning details and themes- elephants, hummingbirds, arrows. Perhaps one of my personal favorites shows the front door of the home, coats and backpacks hung and shoes scattered... a common site for most moms but illustrated so beautifully. While this is one of the few coloring pages that really portrays motherhood, the quotes and Bible verses throughout are a different story. So many great words of encouragement and inspiration throughout, either about motherhood, or very much relevant. I must admit, I was hoping for some more hand lettering instruction through out as this is something I really want to improve on, but there is a simple practice page at the end, and of course the pages throughout that you can trace, practice on, color, etc. I love that unique aspect of this particular coloring book...something to set it apart! Rather you are looking for a greeat coloring book to help you find a moment to relax with your children, or are on the search for your mother or a mom in your life who could use some relaxation and encouragement, this book is sure to be a hit! Home is Wherever Mom Is: Creative Coloring and Hand Lettering is available to purchase now. Oooh I wish there were previews of some of the pages!! I like seeing them before buying them! I love that you say its unique! Now Im intrigued! !